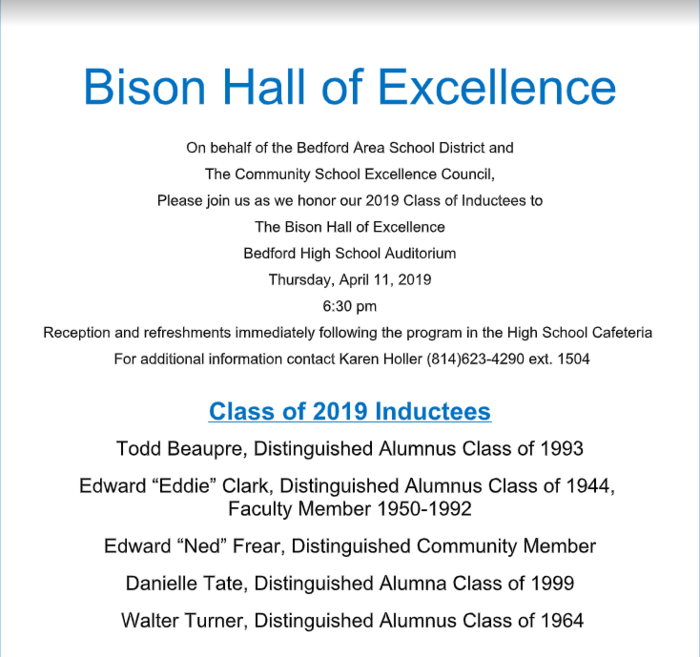 Please join us as we honor our 2019 Class of Inductees to The Bison Hall of Excellence. More details can be found in the NEWS section of the Bedford Area School District webpage. This afternoon Bus #2 was involved in an incident. Although there was no serious injuries, a number of students are being taking to the hospital for out of an abundance of caution.Parents of involved students are being contacted directly. More information will be forthcoming. Due to the inclement the Bedford Area School District will be operating on a 2-hour delay on Monday, March 4, 2019. Due to wide spread power outages the Bedford Area School District is operating on a two-hour delay today, Monday, February 25, 2019. Due to the winter weather the Bedford Area School District will be operating on a 2-hour delay, tomorrow Thursday, February 21, 2019. Due to the impending inclement weather, the Bedford Area School District will be closed tomorrow, Wednesday, February 20, 2019. Due to the icy road conditions the Bedford Area School District will be operating on a two hour delay today, Monday, February 18, 2019. Due to a scheduling conflict the meeting for all Junior Parents to discuss and plan Prom Walk-Ins and After Prom will now be Tuesday, February 19th in the BHS Library at 6:00 PM. Parents of Juniors are all invited to a meeting in the BHS Library on Wednesday, February 20th at 6:00 PM to discuss and plan Prom Walk-Ins and After Prom. As a precaution, the Bedford Area School District will be operating on a two-hour delay tomorrow Wednesday, February 13, 2019. Due to the continued inclement weather the Bedford Area School District will be closed today, Tuesday, February 12, 2019. 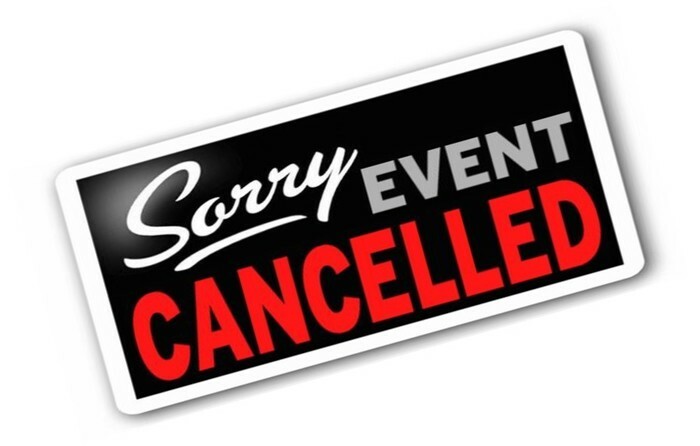 The board meeting scheduled for tonight Monday, February 11, 2019 has been canceled. The next scheduled meeting will be on Tuesday, February 19, 2019. Due to the winter storm watch the Bedford Area School District will be closed today, Monday, February 11, 2019. Early Dismissal Update . We dismissed walkers and drivers from BMS and BHS at 1:15 pm. Buses will depart the district building’s starting at 1:40 pm. Bus 22 will be delayed and we will be holding students until the bus arrives. We will provide an update on bus 22 shortly. Due to the inclement weather, the Bedford Area School District will be dismissing students 2-hours early today, Friday, February 1, 2019. All after school activities are also canceled. Due to the extremely cold temperature and wind chill factors, the Bedford Area School District will be closed, tomorrow, January 31, 2019. All after-school activities for the Bedford Area School District are cancelled for today Wednesday, January 30, 2019. The Bedford Area School District will be dismissing students 2-hours early tomorrow, Wednesday, January 30, 2019. We will be starting our school day on time and dismiss students 2-hours early due to expected drop in temperatures and wind chills. Please dress accordingly. Due to the extremely cold temperature and wind chill factors, the Bedford Area School District will be operating on a 2-hour delay, Tuesday, January 22, 2019. Due to the extremely cold temperature and wind chill factors, the Bedford Area School District will be closed, today Monday, January 21, 2019. Due to the cold air temperature the Bedford Area School District will be operating on a 2-hour delay, Monday, January 21, 2019. The corn hole tournament this Saturday has been cancelled due to potential bad weather. If you have already paid please see Mrs. Ruffley for your money back. A make up date has not yet been determined. Thanks for understanding! Bedford Elementary School had a false alarm fire drill today, December 10, 2018 at approximately 12:30 PM. All students were evacuated, accounted for, and returned safely to the building. Due to the inclement weather the Bedford Area School District will be operating on a two-hour delay on Friday, November 16, 2018. Due to the impending inclement weather and ice developing on roads the Bedford Area School District will be closed today November 15, 2018. Due to the impending inclement weather on Thursday, November 15, 2018, the Bedford Area School District will be operating on a two-hour delay. Bedford Area School District is committed to celebrating a culture of Excellence! The Community School Excellence Council (CSEC) is seeking nominations for the 2019 Hall of Excellence. Do you know of an alumni, community member or retired faculty member who epitomizes service, leadership and achievement? 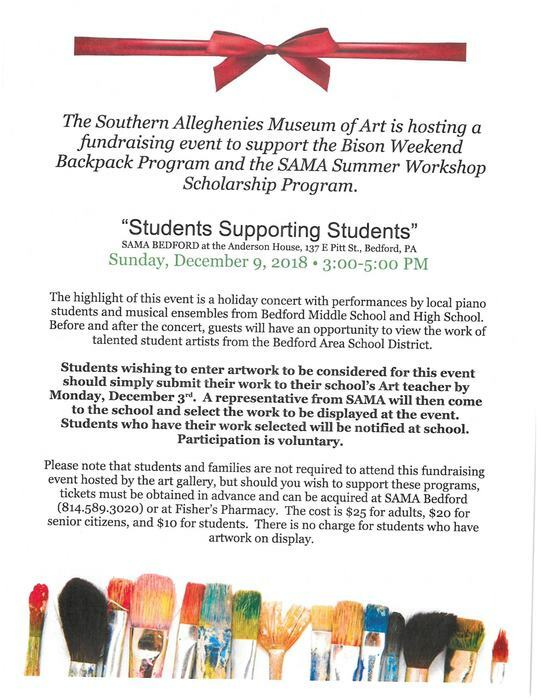 For more details please visit the news section on the Bedford Area School District website. Due to continuous flooding the Bedford Area School District will be operating on a 2 hour delay, today, Tuesday, September 11, 2018. Due to severe flooding and flooded roads, the Bedford Area School District will be closed today September 10, 2018. The Bedford Area School District has now dismissed all students. Please expect buses and student drivers to arrive 15 minutes later than normal. The Bedford Area School District has delayed dismissal today due to a severe thunderstorm located over the district during dismissal. Given the current radar, we only anticipate delaying dismissal for a few minutes. Due to the inclement weather the Bedford Area School District is operating on a two-hour delay today, Monday, April 2, 2018. Due to the inclement weather the Bedford Area School District will be closed today, Wednesday, March 21, 2018. The make-up day will be Easter Monday, April 2, 2018. The Bedford Area School District will be begin Wednesday, March 21st operating on a 2-hour delay.At 5:30 am we will re-evaluate road conditions and update you on any changes depending on the weather. Due to the impending inclement weather, the Bedford Area School District will be closed today, Tuesday, March 20, 2018. The make-up day will be Tuesday, April 3, 2018. New School Bus Drivers class April 7th and April 14, 2018 from 8-AM to 4-PM. Contact Helsel Transportation at 814-285-7951 to reserve your seat in class. Bedford Area School District Buses 13,16,19,23 and others may be delayed by a downed tree. The Bedford Area School District is experiencing flooding on bus routes 2,3,4,5 and 8. For further information please go to the "News Section" on the District website, www.bedfordasd.org. A fire alarm was activated this morning at Bedford High School due to malfunctioning smoke detector that triggered the alarm.This is not an emergency, all students are safe at this time. For the Bedford Area School District, the make-up day for yesterday's school cancellation will be Friday, February 16, 2018. Due to the inclement weather, the Bedford Area School District will be closed February 7, 2018. Superintendent Dr. Allen Sell shared a message regarding the weather notification issues. To read more, check out the 'News' section on the District website. We are aware you received several calls this morning. In working with our provider, they have found and resolved their computer error and assured us it's fixed. We apologize for any inconvenience. Due to the refreezing of roadways, we will be operating on a 2hr delay today February 5, 2018. Due to the inclement weather, school will be closed January 5, 2018. The make-up day will be Monday, January 15, 2018. The 21st Century after-school and after 3 programs are cancelled for this evening January 4th. All other activities including sporting events, practices, and other events will proceed as scheduled. WE ARE MOBILE! Check the "News" section of our District Site to learn more. Bedford Area School District awarded school safety grant for more information see the news article. We at Bedford Area School District would like to welcome you to our updated website.